With so many digital tools at our disposal these days, handwriting often seems so far behind us. Of course many of the individuals whose work I read online are more likely to keep the faith than others, however when the words generally end up as pixels, perhaps it can be hard to justify transferring them from one to the other. Some time ago I posted a picture on Twitter containing a page of handwritten words with a caption noting the (blog) post was now complete. In response, one commenter stated there was no way they had the time to perform such an undertaking. Another was surprised the proportion of posts I wrote this way was not higher (which I believe I estimated at around 30% at the time). At the time I considered this for a little while and then didn’t really pay much attention to the thought — until more recently, when I realised the number is now reversed, with around 70-80% of posts you read here written longhand in their draft form1. A complete reversal of that proportion is a significant change, and for such a change to occur without a conscious plan to do so, suggests there are factors at play which perhaps warrant a little more thought. Looking back to the first couple of years of writing here, it is not hard to remember how things went. Ideas were kept in Evernote (often appended to the one note via a Drafts app extension); stimulus and/or reference material gathered online was largely stored in Pocket; and occasional post outlines created as mind maps using MindNode. Sure, some handwritten notes were made in various pocket notebooks or slightly larger variants, however things were largely digital, and as I think back on it, the proportion was perhaps even higher than the estimated 70% of my original estimation. Even those handwritten ideas soon became text in Drafts or Evernote. So the digital basis for a post was created, and all that remained was perhaps for some from of outlining and a first draft to follow. As I mentioned above, planning (on the rare times it occurred) was generally undertaken as a mind map, followed by writing — initially in Byword, and since 2014’s NaNoWriMo: Ulysses. This process seemed to work for a good while, and I was happy enough for it to continue. For years I dove in on Page One, put my head down and started hammering keys. That’s not always a bad idea. Sometimes it works. But what usually happened for me was I’d get halfway through before it hit me that I was totally lost. Or I’d finish completely only to realize that I basically had to tear the whole house down and start over. I’ve alluded above to the “rare times” post outlines occurred for good reason. If we take, say, 70% as a reasonable estimate again — that is about the proportion of posts which were written by sitting in front of the keyboard and writing. No real plan or outline other than a few random notes perhaps. That is not to say these posts were necessarily of high quality having been written this way, simply to say I may not have necessarily completed them all with a different approach. As time has passed, I’ve found this an increasingly difficult way of getting words down on these pages at an acceptable quality and rate. On the surface I am not entirely sure why that is, however suspect (and hope) my writing has at least improved to some degree since commencing this blogging endeavour in the first half of 2013. Like many (I assume) — I don’t tend to go back and read many of my previous posts, however there is probably immeasurable value in doing so. If we then assume I would like my writing here to continue improving, a little more structure was needed. Part of that structure began with increasing my use of those mind maps, and more recently, outlining in Workflowy. Perhaps there is something in the outlining versus mind mapping debate as far as which suits my style of planning best, however that is a post for another day. One great advantage of a longhand draft is that, in transferring it to the computer, every single word is written at least twice. Then the computer draft can be endlessly revised. When you write in longhand you’re unconsciously aware of aspects of your prose – such as sentence length, cadence, rhythm, repetition, prolixity – that I find keyboard writing doesn’t alert you to in the same way. Also you can see all the litter of the progress you’ve made that day – the scorings-out; the arrows; the insertions; the bubbles; the second, third, fourth choices. The page reflects the mental effort that the screen doesn’t. It’s a toiling, messy business writing a novel. Now of course I am not talking of novels here, and am always loathe to make comparisons with those who are actually writers (even though I’ve now done it twice in this post already), however the above quotes state quite succinctly what I believe to be occurring here — particularly the thought on every word being written twice, and the possible advantage to that type of approach. So, in changing how I approach my writing here, where have I now ended up? For all of the words you’ll read in this post, here is where things are decidedly uncomplicated — probably a very telling point in itself I believe. There is a pen. There is paper. They have a simple job in getting words on a page, and typically perform it admirably without interruption, syncing, charging or crashing. Save for a few ink refills, once I’m up and away, I’m well…up and away. That said, I always think it is a little disingenuous to compare pen and paper directly to the digital tools at our disposal these days. After all, there is a heck of a lot those digital tools can do — and do extremely well, that our humble analogue favourites cannot. Once those words are transferred into the digital realm, they are available to me everywhere; are searchable; editable; and eventually exported and published. As I mentioned earlier, a post starts as an idea, is expanded into an outline (which may equally occur in digital form), then written as a longhand first draft – all very simple. Sure, those original source containers remain, in places such as Pocket, Safari, Notes, or even web-captured PDF’s, however you’ll find a good many more on scraps of paper or in pocket notebooks as well. Put an outline in Workflowy into the mix, displayed on my iPad beside me, and the handwritten words simply flow. For those who perhaps may be interested in the specific tools, let’s just say it is a team effort — with many of the fountain pens, inks and notebooks I own all playing their part. You may have previously read about some of them — or may indeed do so in the future. Of course, some of you reading this will have no doubt been writing this way for a long, long time — particularly pen bloggers and the handwritten review, to which none of this is particularly ground breaking — a fact I readily acknowledge. Now, I’m sure we’ve all seen various articles around the web reporting on the benefits of taking notes by hand as far as retention and learning, however that is not what I’m talking about here. In slowly transitioning to writing a larger proportion of posts this way, you would be correct in thinking there must be some underlying benefit. For me, the benefits are two-fold: more enjoyable writing, and more effective writing. 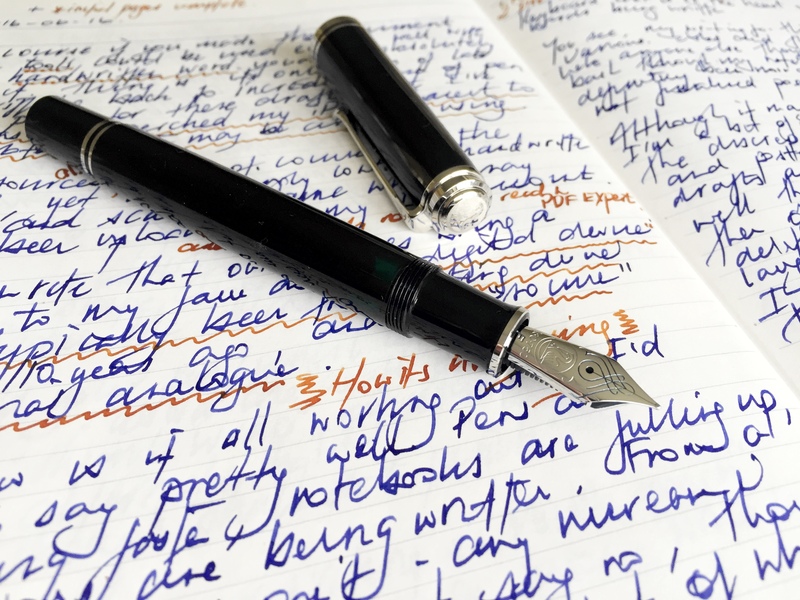 As far as more enjoyable writing is concerned, there would hardly be a pen lover amongst us that would not enjoy using their favourite pens and inks on a more consistent and frequent basis. Fountain pens are drained, more inks are sampled and notebooks filled. Contrasting inks are used for editing and revision. It is not so hard to see the benefits here. I’m a little suspicious that somewhere in the recesses of my mind I seek to continue this cycle of more pens, more inks and more notebooks — though I am hoping for perhaps a more noble conclusion about this improved writing process. How about more effective work? Explaining the benefits I see in this aspect of my writing is perhaps a slightly more difficult proposition to those heavily invested in digital workflows for such a thing. The fact I have written many more drafts this way which remain unpublished is a victory in itself — for the more I write, the more I’ll eventually publish. As I’ve written about before, unpublished posts remain so often due to topic rather than process or quality, though of course not publishing garbage is also an ongoing aim. So just how is writing in longhand more effective for me? Quite simply in the flow words onto the page. I’m a bit of a tweaker really, and when writing digitally at a keyboard, tend to stop, think and edit a little as I go, which on a first draft, ends up taking an eternity, given the amount of editing and rewriting which occurs. When drafting in longhand, I stop, think, and then continue writing — saving the editing and revisions for a few inserted notes, highlights or strikethroughs later, followed by an automatic editing stage as the handwritten words are transcribed digitally the first time. I find I am far more effective at actually getting from start to finish, and by the time the first digital draft appears in Ulysses, it has been reviewed and has been rewritten as it is transcribed. A final read through and revision is (usually) all that is then required before publishing. Conversely, with all the stop start editing, a post beginning its life in digital form may see a two-fold increase in the number of edits and revisions made prior to posting, for I believe no great improvement in content or quality. Even the “just jump in start writing” approach was in the past more effective than the constant “write and tweak” which tends to occur the longer I have a post in my Ulysses drafts folder. Put simply — drafting in longhand sees more writing and less endless tweaking. A win for me by any measure. With any approach to something like writing, things will never be perfect, and yes — of course there are some disadvantages to writing this way. One such disadvantage I’ve found is in covering some of the same ground twice. At times I don’t always have the same notebook with me, and in picking up where I left off (or at least thinking I am), I’ll occasionally rewrite a section. Why I do that is anyone’s guess, and you could validly argue why on earth wouldn’t I remember where I was up to — and to be honest I cannot really answer that. Of course this is simply a process fault which could be easily rectified by ensuring I do have a specific notebook dedicated to this process which is always available when I need it. The reason that perhaps won’t happen is that I’m often trying out different notebooks and enjoy a little variety what I am using. In any event, yes it may be wasted time in some respects, however on the plus side I do get to then choose from the better draft, and I’d also refer you to the more enjoyable writing paragraph above. To a lesser extent, even when I do use the same notebook, given these drafts often occur in fits and starts over a number of days, most sections of the posts have other material interspersed on pages between them, so there is a little flipping backwards and forwards at times through the actual notebook. Not a big deal, and assisted by reasonably consistent indexing and notations of page numbers. Finally, and probably most obvious to many who write digitally — time. Yes, this approach would of course take far longer than an exclusively digital form of writing, with syncing across multiple devices and ease of editing, rearranging and rewriting those words. If that is how you write, you’ll hear no argument from me, and I’m certainly not advocating throwing away your keyboard. Things have simply changed a little in how I approach my writing, and I am finding it far more enjoyable these days, so thought I’d share a little about the changes, and my thoughts around these processes. There is nothing like sitting down and outlining, drafting and revising a post such as this one, to point yourself in the direction of possible improvements in some of these processes — and this one is no different. It looks as though I may need another notebook or two, some more ink, and maybe even another pen. Such a shame. If my new-found longhand writing process requires a few more tools and a broader experience in using them — I’m all for it. While you may not end up reading them all, I can guarantee there will be plenty of writing going on, and for that I couldn’t be happier. Moving to longhand seems however more difficult to me than writing on my laptop. As you stated…most of the phrases are indeed written twice. But it seems part of the thinking proces. As I write, the sentences flow simultanouesly, what brings up new ideas or points of view. Letting the pen just flow like my fingers on my keybord seems something not to strive for. It is a more mindful proces. And i think it is good to practise that at times. I can certainly see how it mightn’t be for those with effective digital writing workflows in place. I do think a significant part of the appeal is in using my analogue tools, however I have noticed it seems to suit my writing style as well. I too write longhand. But yeah now that I finished my draft, i have to transfer it to the digital version wich can take a while. To add to that, I guess i didint think much of that when i wrote the draft and as a result it is kind of messy and i figure out what the hack I actually wrote before typing it lol. Yes I’m the same at times – occasionally the conversion to digital takes a little longer than it should. I also tend to rewrite quite a bit, but I guess I would be doing that anyway. Whatever works! Sorry for the typos. My Keyboard battery is dead.